A new survey of the post-Millennial Generation, coined Generation Z, suggests the political leanings of the future could end the Republican Party as we know it. As the Republican Party continues to turn right, young Americans views are heading to the left. According to the Pew Research Center, Generation Z members see government as a tool for good. It’s a significant contrast to the right, which has been campaigning on “small government” for decades. When it comes to President Donald Trump, only three in ten approve of the way he’s handling his job as president. It’s a significant contrast to Gen X (38 percent) and Baby Boomers (54 percent). Race is another major difference between younger generations and their parents. The Millennial Generation was the most diverse generation in American history and subsequent generations will only surpass those numbers. Generation Z is now the most racially and ethnically diverse. With it, attitudes toward people of color have changed. 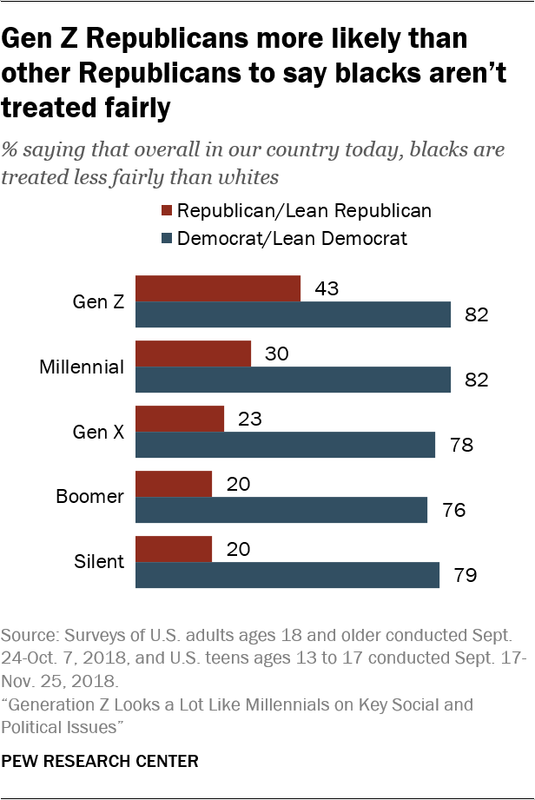 Gen Z members who consider themselves Republicans also see racial disparities, despite tendencies of their older counterparts. They’re almost twice as likely to believe blacks aren’t treated fairly. These young Republicans also are more likely to believe climate change is real and man-made. The generation also believes the government has a duty to solve such problems. 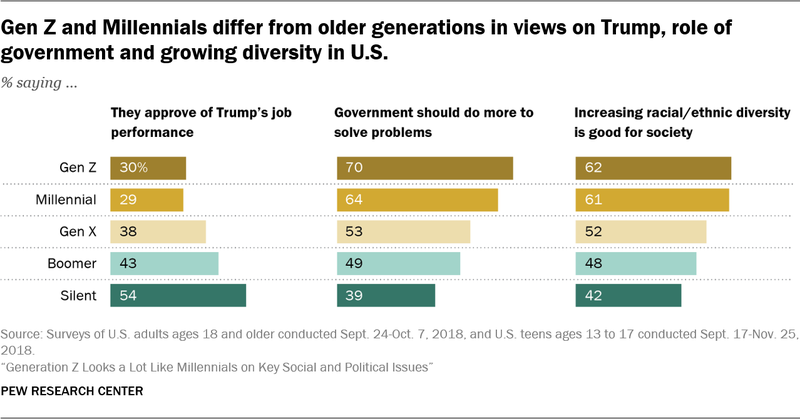 The two younger generations are also more likely to accept the ways in which American society is changing, while older generations resist the evolution of the United States. One way in which Generation Z is different from Millennials is gender identity. These young people (35 percent) are more likely to know someone who prefers a gender-neutral pronoun than any other generation. Pew speculates this is about the cultural context of the generation, which has come of age discussing the role of gender and that gender assignment at birth isn’t indicative of future gender identity. All of this spells disaster for the Republican Party as they’re known today.